An Oakville, Napa Valley wine estate dedicated to producing the finest wines each vintage allows. 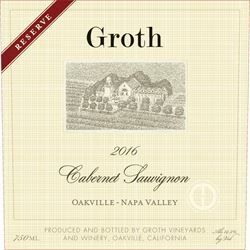 Escape to a quieter side of Napa Valley and come see why the Groth family is 'Rooted in Oakville.' Visit our 121 acre Oakville estate and winery to taste wines produced from our vineyards. Taste our exceptional Napa Valley Sauvignon Blanc and Chardonnay. Most recognized for incredible Oakville Cabernets, including the Reserve Cabernet Sauvignon, when available. Tours and Tasting available by appointment. To join the wine club, visit www.grothwines.com or call 707-944-0290. All wine club members receive four shipments a year at a 15% discount and can purchase any of our products at the same discount. Each shipment contains two bottles of wine. We have four varietals for shipping, Cabernet Sauvignon, Sauvignon Blanc, and Chardonnay. "Team Red Stripe" Members also have exclusive invitations to food and wine pairings and other events. They can also schedule free tastings at the winery for up to 4 guests that include a sampling from Dennis Groth's wine library. 10% discount on wine purchase. Groth Vineyards & Winery is certified under the Napa Green Winery Program by the Napa County Department of Environmental Management (DEM) and the Association of Bay Area Government’s (ABAG) Green Business Program and completed all the regulatory components needed for environmental sustainability. These components included developing water and energy conservation methods, preventing pollution, and reducing solid waste. In addition to developing sustainable winery practices, this program is set to become the standard for the state of California. Groth Vineyards & Winery is certified under the Napa Green Certified Land Program. Groth Vineyards & Winery has created and implemented a customized farm plan with measured results that addressed all aspects of its property, vineyard land as well as non-farmed land, including practicing soil conservation, water conservation, stable drainage, riparian corridor enhancement, fisheries and wildlife habitat enhancement and long-term improvement and sustainability.